REVIEW - Elite: Dangerous - Use a Potion! Over the last generation in gaming there have been a plethora of games that grant you freedom; the sandbox. Whilst typically you have a path dictated to you through the form of a narrative, you’re still given this sense of freedom that allows you to approach things exactly as you please; some games allow you to drive freely from city to city in a sports car, some games allow you to roam the Wild West and others will let you venture through the post-nuclear remains of a desolate wasteland. Whatever you choose to do, there’s still always an ultimate goal or story to complete – an endgame. Elite: Dangerous takes a different route. It places you in an accurately recreated 1:1 scale galaxy based on the actual Milky Way, it gives you a space ship to navigate through this galaxy with and then it allows you do whatever you want. There’s no narrative that you’re forced to follow to progress or even an endgame that gives a sense of completion. You have complete freedom to play Elite: Dangerous exactly how you please; something that is one of the best things the game has to offer, but at the same time the feature that leaves the game often lacking purpose. You start Elite: Dangerous with an un-impressive ship in a random Space Station, holding a mere 1000 credits to spend how you please. From there, it’s all on you – will you explore the galaxy trying to be the first to set eyes on an undiscovered planet? Will you become a Space Pirate, attacking one of the many ships that reside in the galaxy for their cargo? Will you be an honest worker and deliver cargo between locations? No matter what your plan might be, you’re best bet would be to run through the training missions first and learn how to pilot your ship. 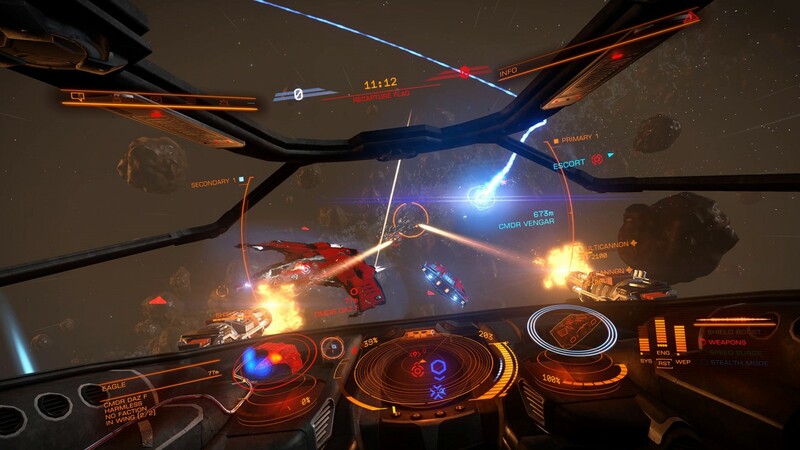 Whilst it’s clear that Elite: Dangerous was built to be played on a PC with a keyboard, it’s certainly an achievement that developers Frontier Developments managed to make the transition to Xbox One controller work so intuitively. Whilst it can be daunting to begin with, you will eventually start to get to grips with the controls. They aren’t perfect and there is a lot of flicking between buttons but fortunately they’re effective enough to play through the game with minimal hassle. The problem with the lack of buttons on a controller is resolved through the use of different button combinations; standard procedures like throttle or the use of weapons are allocated to the shoulder buttons, whilst more complicated procedures like the use of your cargo scoop or landing gear is given a simple button combination. Sub-menus of your ship are easy to access too with a simple button press bringing up the UI. It’s fortunate that the controls are mapped efficiently as Elite: Dangerous offers an authentic experience with piloting. It’s not as simple as pressing a button to take off, but instead has you following a set of procedures to start your engines. Even docking at a Space Station requires you to request permission from the station, carefully manoeuvre to the correct docking point, lower your landing gear and carefully land with precision. It sounds like hard work, and initially it is – the amount of times I messed up docking my ship before getting it right is unspeakable. It all adds to the authentic experience that the game offers, and it does comes naturally in the end – you’ll become an aficionado pilot in no time. After learning the ins-and-outs of the controls you’ll want to earn some credits to purchase a better ship. There are plenty of ways to do this and your given total freedom to choose how – the easiest method to begin with is by accepting jobs from the bulletin board located at each Space Station. There are a variety of jobs on offer ranging from delivering cargo, mining minerals or even taking part in battles for one of the many factions in the game. There’s plenty on offer and it’s a good way to make a start to your life in space. An alternative that will be tempting to some players is to take on the life of a Space Pirate – attacking NPC ships and stealing their cargo. Admittedly, it didn’t take long for me to resort to piracy; the standard line of jobs can get tiresome in time, and there is a certain satisfaction in playing the villain. Of course, you aren’t the only Space Pirate in the galaxy so you have to be prepared for combat at any moment. 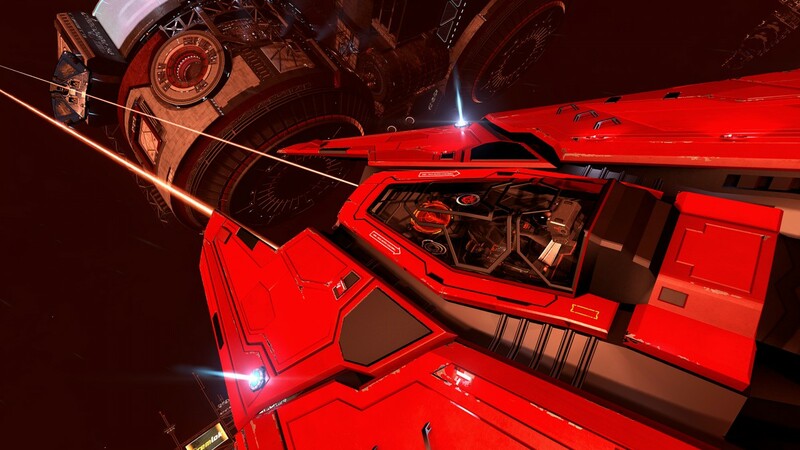 Elite: Dangerous offers some intense battles, pushing both your ship’s equipment and your piloting skills to the limit. You’ll need to carefully follow your opponent’s movements, adjusting your thrusters and manoeuvring with care as you try to keep out of your opponent’s line of fire whilst maintaining your target on them. It’s thrilling stuff and offers satisfaction in each victory; there is nothing quite like seeing an enemy ship’s shields go down, allowing you the opportunity to unleash hell and watch them explode in flames. It isn’t all smooth sailing in Elite: Dangerous though; the game doesn’t really offer you much guidance aside from the opening tutorials. You’re thrown in the deep end from the start, with tasks as simple as navigating from one Space Station to another requiring careful co-ordination. If you’re not properly equipped you can quickly bite off more than you can chew – fortunately there’s a large variety of ships that you can purchase, each having pros and cons depending on how you like to play. Do you enjoy more of a combat-free play style and want to spend your time delivering cargo? Then the Freighter ships are for you, offering plenty of space for your cargo but at the expense of speed and combat capabilities. The Combat ships on the other hand are fast and agile, armed to the teeth with weapons to take down foes with ease. Of course, if you’re not interested in combat or lugging cargo from Space Station to Space Station then the Explorers are for you; ships that are fully equipped to explore the galaxy with minimal fuss. The variety of ships is vast, and each one has their own unique look from everything to the exteriors to each ship’s dashboard – the attention to detail is fantastic. 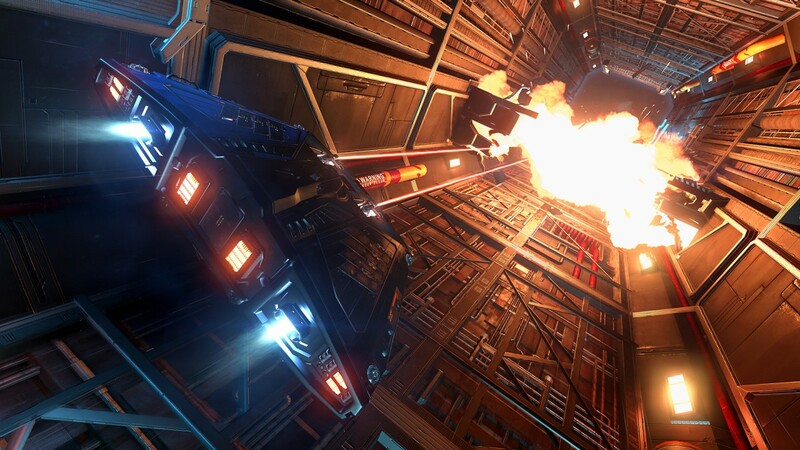 The exploration in Elite: Dangerous will be very dividing among players. With the accurate 1:1 scale you’re given an absolutely huge area to explore; you can spend hours upon hours navigating through Space. You’ll constantly be discovering new planets (that if you’re the first to discover can tie your name to), uncovering new Space Stations or just finding a new source of sought-after minerals. Unfortunately, exploration can take a long time. There are huge distances between locations and, despite how fast you travel, you’ll spend plenty of time just getting from point A to B. Journeys can be interrupted by attacks from Space Pirates too – despite how entertaining Space Dog Fights are it can still be a nuisance when you just want to explore in peace. Exploration is not for everyone; I imagine plenty of players will find it a bore and may not want to dedicate all their time to it – you’ve got to be ready to invest plenty of time in Elite: Dangerous if you plan on staying for the long haul. One thing all players will agree on though is that the game looks stunning. You won’t get to see everything in your time with Elite: Dangerous; there are over 400 billions systems to explore after all. What you do see though is awe-inspiring – be it the huge burning stars, the hulking, colourful planets or just the impressive Space Stations. The visuals are outstanding, with not much lost with the transition to console. Admittedly, there are moments where the game may suffer from a bit of screen tearing and busier moments are often met with a bit of stuttering in the frame rate; none of this takes away from how magnificent the game looks though. 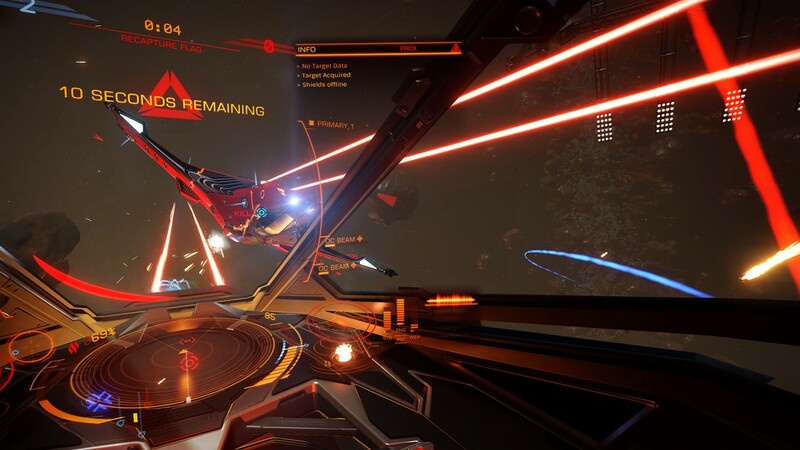 Elite: Dangerous can be played both alone or online with other pilots, though the sheer size of the galaxy means it’s can be a quiet experience. You can also partake in a brand new mode called ‘CQC Championship Mode’ that allows you instant access to powerful ships to partake in online Space battles across a variety of battles types. It’s a great extra addition and will certainly appeal to those who just want to get right into the action rather than take part in the grind that the main game can often feel like. Elite: Dangerous is a game that’s mainly full of positives, but it has one flaw that will put off many players: a lack of purpose. There’s no big story that you will want to complete and the game often almost gives you too much freedom to decide what to do. Whilst some players love this style of play (especially as there isn’t a short supply of things to pursue), other players may find it intimidating. 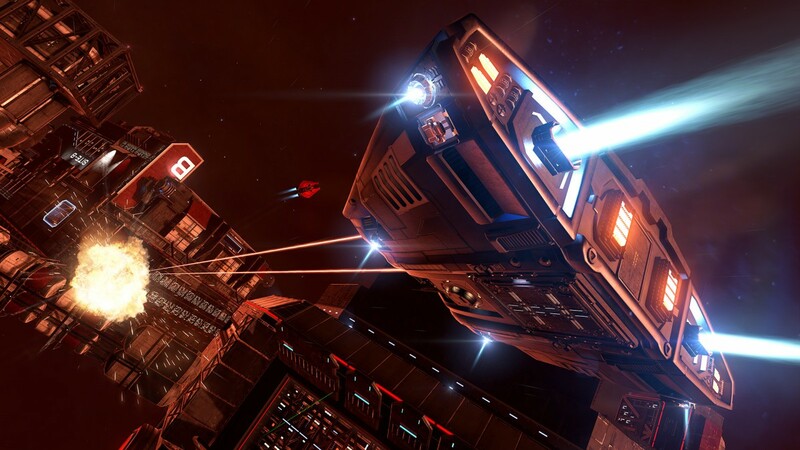 Some players want to be told what to do, told how to play – something they won’t find with Elite: Dangerous. It’s both a pro and a con, it all comes down to the player’s preference. Myself though? 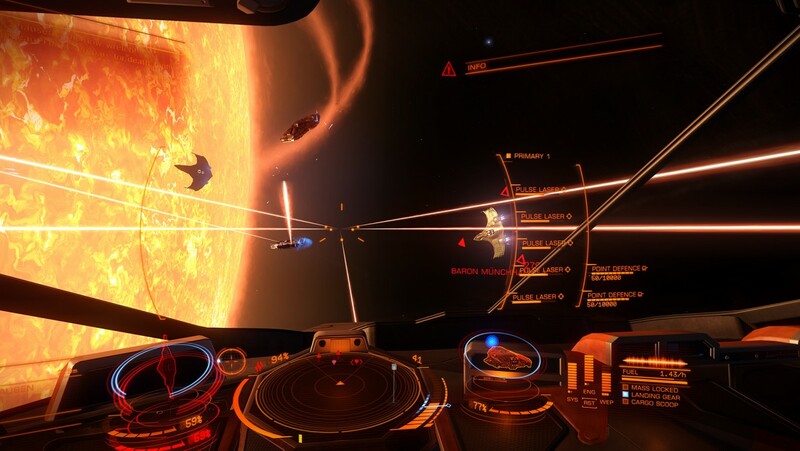 I found Elite: Dangerous a fantastic experience, one that I can’t keep myself away from. It was the first game in a long time that really had me in awe of what I was a part of – an experience that really defines what true freedom is in a video game. There’s also the promise of further additional content down the line such as planet exploration and pilot customisation. Elite: Dangerous is a game that’s just going to get better and better; it’s all the more impressive when you consider the high standard its already reached. 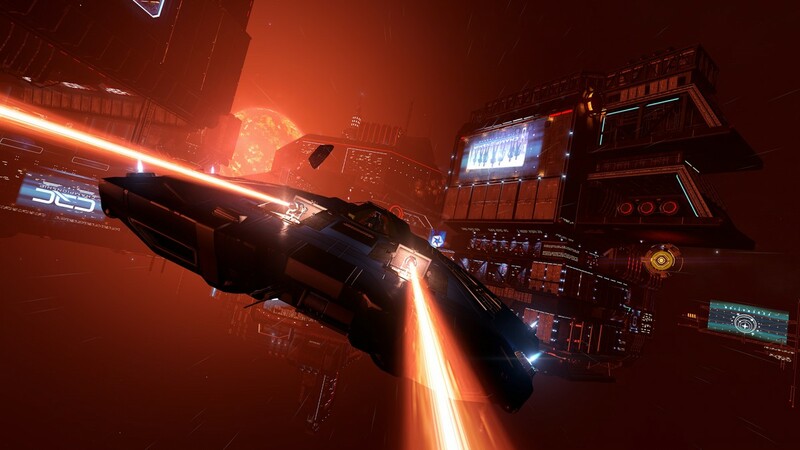 Sure, Elite: Dangerous isn’t for everyone, but those who do enjoy this kind of experience will love what it has to offer. I fall under that category and I can wholly admit that I think Elite: Dangerous is a fantastic video game – one of the best I’ve played this generation.